Whether you need an optometrist for a routine eye examination, to find the right pair of contact lenses or glasses, or for more advanced eye care services, our eye doctors have the right experience, expertise, and “chair-side” manner to make you comfortable on your next visit. 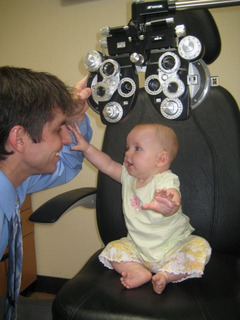 With years of outstanding service in the community, our optometrists, Dr. Cook has a reputation for excellence. From our vision clinic in New Tampa, Dr. Cook also provides optometry and eye exam services to Wesley Chapel (FL). Dr. Cook and the staff at New Tampa's Walmart Vision Center strive to provide a thorough and convenient eye care experience. Exam appointments are available five days a week including Saturdays and Sundays(no Wednesdays and Thursdays) and walk in appointments can usually be accommodated. We have fun while making people see better. Looking for an eye doctor in New Tampa? Google Maps and Directions to our New Tampa Eye Clinic for your next eye exam, only minutes away from Wesley Chapel. State of the art retinal imaging instrumentation - watch the Optos Retinal Imaging video! Introducing our new non-invasive, high tech icare Tonometer - Although our "air puff" test is quite gentle many patients still find the experience a bit unpleasant. That's why we've added the new icare tonometer which takes the same reading without an air puff at all!!! If you don't want the air puff just let us know. Interested in Contact Lenses? We offer precise professional training and service to ensure the ultimate comfort and vision. Better vision has a direct impact on your quality of life. Make sure that your eyes are in good health by taking time for regular vision check-ups. Our state of the art testing services are designed to go far beyond simple prescription writing. Early detection and treatment of ocular problems is critical for long term vision health. Our comprehensive examinations are among the best you will find. But don't worry, we also do write and fill eyeglass prescriptions. Gentle Vision Shaping (GVS) also known as Orthokeratology, Over Night Sight, or Corneal Refractive Therapy is an exciting process by which patients can be fit with special contact lenses that are worn ONLY at night. Amy Rayne Cook is born!!!! We finally got all the paperwork submitted and approved to accept Tricare. We will now be happily accomodating our troops both past and present as welll as their families. In case of emergency, please call 813-334-2921 or go to an emergency room.